The question comes up now and then from folks investing in one of their first vintage planes… What’s the difference between Stanley planes, Bailey Planes, and Stanley Bailey planes? It’s confusing, because the terms are often used interchangeably. Worse, depending on the tool and the time, the terms may indeed be quite correctly used interchangeably, whereas with other tools and times they may not. It’s enough to make a new collector’s head spin! To make short work of figuring this all out, let’s start with Stanley. The Stanley company itself originated as ‘The Stanley Works’, founded by Frederick Stanley in 1843 in New Britain, Connecticut, and eventually incorporated in 1852. They subsequently spun off the ‘Stanley Rule & Level Company’ in 1857. This stood until 1935 when the company reorganized simply as Stanley Tool. Leonard Bailey was a designer and plane maker who patented several designs for hand planes in the mid 1800s. In 1869, Stanley Rule & Level bought seven patent rights to Leonard Bailey’s designs. While their relationship with Mr. Bailey only lasted until 1875, Stanley retained those patent rights and eventually the use of the Bailey name. After the relationship between Stanley Rule & Level and Leonard Bailey fell apart in 1875, they ended up in court over a patent infringement dispute (which Stanley eventually won) over the designs of Stanley employee Joseph Traut. Bailey went to work for Selden Bailey’s (no relation) Bailey Tool Company and in 1878 moved from Hartford, Connecticut to Woonsocket, Rhode Island to oversee the manufacture of their Defiance and Leonard’s own Victor line of planes. Both of these lines struggled and Stanley ended up buying both in 1880 and 1884 respectively, but then discontinued them by 1888. Leonard Bailey thus retired from plane making but continued his copying press company, (Bailey Manufacturing Company), moving his factory to Wethersfield, Connecticut with a sales office in New York City until his death in 1905. In an apparent nod to his contribution to their overwhelming success, or perhaps for branding reasons, Stanley started casting the Bailey name into the beds of their plane bodies around 1906. Regardless of which name is stamped on them, virtually every bench and block plane Stanley made from 1869 forward are all referred to (somewhat generically) as ‘Stanley Bailey’, or simply ‘Stanley’ or ‘Bailey’ – all are technically correct. 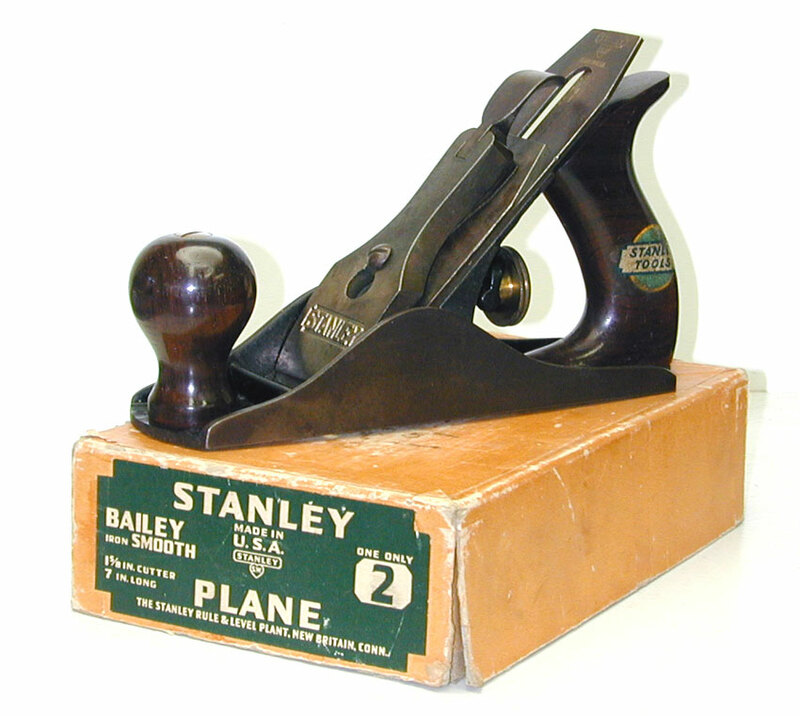 The Bailey planes comprised Stanley’s basic bench plane line and the company made millions of them. Some (years of manufacture) had the Bailey name stamped into the bed, while others did not. All, however, refer to the various design patents originated by Leonard Bailey, as ‘Bailey’ was never actually part of the Stanley company name. As the patent rights expired late in the 20th century and hand tools began falling out of favor, the Bailey name was eventually dropped from use. The designs and patents of Leonard Bailey, Joseph Traut, and others, however, still live on in many of the hand planes available on the market today. Lie-Nielsen, perhaps most notably, manufactures a very high quality line of planes based specifically on Stanley’s premium line of Bedrock planes. So, to answer the question… all Stanley Baileys can appropriately be referred to simply as Stanleys, as can many Bailey planes as well – the terms are frequently used interchangeably. Just remember that not all Baileys were Stanleys. It depends on the model and when they were made. The early non-Stanley Bailey planes tend to be more rare and quite valuable. For more information on the entire detailed history, try John Walter’s book, Antique & Collectible Stanley Planes, Roger Smith’s, Patented Transitional and Metallic Planes in America 1827 – 1927, or Alvin Sellen’s, The Stanley Plane. Why is the theme of this about collectors? Is there something wrong with using tools these days, that’s what they were made for? Hand planes have certainly not been replaced by power versions for many jobs. I cringed when I saw the photo, a plane should always be parked on its side never on the blade side. That applies as much to power planes as hand planes. Not sure where you got the idea this site theme is only about collectors. That’s just ‘plane’ crazy! Many, if not most, of the posts discuss restoration and tuning for use, and virtually every plane I sell is intended to be used! Regardless, thanks for visiting the site and taking the time to post a comment! Thanks, This clears up a lot. I just inherited some bailey planes. I’m assuming they are made by Stanley… I’ll have to see if I can find any numbers or any other information on them. How can the age and model be determined? Not exactly, but sorta maybe. Talco was made by J.A. Chapman, a metal plane maker and joiner’s brace maker. The company is best known for its range of steel braces but also began making Stanley-type planes under the trade name “Acorn” from about 1934 onwards. Like the Stanley planes, the original Acorns were painted black on the inside of the base casting. In 1936 the company was purchased by The Stanley Works, New Britain, Conn, U.S.A., who then created The Stanley Works (Great Britain) Ltd.. The later examples of these planes were enameled in red. J.A. Chapman also made planes for other makers, most notably GTL, Talco and Spear & Jackson. Thanks, Jeff. To tighten up that tote just grind a millimeter or so off of one end of its bolt until the tote is tight when attached. You state that Stanley started putting Bailey’s name on their planes in 1906. Do you have a source for this date. According to the type studies of Stanley planes Bailey’s name appears on the type 9 which would make it 1902. I am just wondering if you have other information? The Type 9 date range is 1902 to 1907, so the feature changes took place during this approximate period. They did not all happen at once in 1902. That said, I didn’t record the reference from which I got the 1906 date. Most likely from one of the dozen or so books I have on the subject. Hello, I have a couple Stanly planes, Stanly only planes, and 1 Baily plane. I’m having a hard time identifying them, as some where used for 75 years by my grandfather. He had a couple before the war from his dad, and many of them bought in 45 46 47 and up. The problem I’m having is he swapped many of the blades from plane to plane, and I am trying to piece It back together. I am not looking to sell these planes, nor restore them as he used them till his death of late this year (2018), there very well used, but in great shape. Not sure if you help with this type of thing, but any knowledge I can get the better. I managed to at least identify some of the differences between planes with this article so that’s a good start. Email me at vatoolworks@gmail.com. Will need a few photos of each plane and blade, and I’ll see what I can do to help sort it out. Oh great I’ll do that as soon as I am back. Thanks.